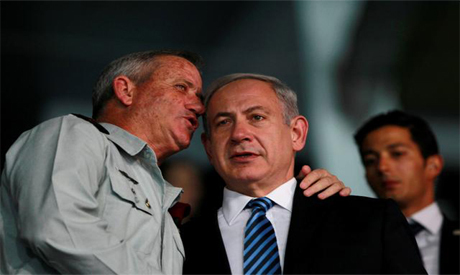 Prime Minister Benjamin Netanyahu's toughest rival in Israel's April ballot, former military chief and political enigma Benny Gantz, will set out his goals on Tuesday in a marker of the centre-left opposition's prospects. Polls predict a Netanyahu reelection, with his right-wing Likud party taking around 30 of parliament's 120 seats, and Gantz's Resilience party coming a distant second with around 15. That would line Gantz up to join a future Netanyahu-led coalition government - unless the ex-general tries to mobilise like-minded factions against the incumbent, now in his fourth term. Much depends on the ideology of Gantz's newly formed party. On this he has so far been silent. His campaign, meanwhile, has stoked his residual popularity from his term as top general with graphic ads claiming hundreds of enemy deaths in two Gaza wars. But mindful of Israeli moderates, Gantz's image-makers also cast him in a softer light, releasing a video in which the tall, taciturn 59-year-old says "there is no shame in pursuing peace". At a launch party on Tuesday timed to coincide with the evening TV news, Gantz was due to deliver his first political speech, with voters watching for combustible policy points like Israeli-Palestinian peace talks, frozen since 2014, or corruption allegations dogging Netanyahu. Tamar Hermann, a scholar with the non-partisan Israel Democracy Institute, predicted Gantz would try to stay "very vague on certain topics: for instance 'yes to peace but Israel's security comes first'". For Netanyahu to be defeated, Hermann said, Gantz would have to bring together disparate centre-left parties. "Anything can happen, but at the moment the most likely outcome of the election would be a (Netanyahu-led) centre-right government," she said. Likud has sought to write Gantz off as a "leftist", casting him as an untested whimsy candidate and no match for Netanyahu, 69, who is also defence minister. As the election approaches, and facing possible indictment, Netanyahu has highlighted his handling of national security, publicly acknowledging Israeli air strikes against Iranian targets in Syria. Martin Dempsey, a retired U.S. army general whose tenure as chairman of the Joint Chiefs of Staff mirrored that of Gantz as Israeli armed forces chief between 2011 and 2015, told Reuters that he would bring "an open mind to change" and have the "instincts to build a team to solve the most urgent challenges". "His silence would likely signal to me that he is carefully and deliberately thinking and learning, preparing to express his views with clarity and confidence, so that he knows who and what he wants to be and do when the political winds begin to blow with greater velocity," Dempsey said.